This is the Monica. A then-contemporary car in 1973 when my World of Automobiles encyclopedia was written, the concern folded in '74. Brainchild of the french industrialist Jean Tastevin, engineered by C.J. Lawrence, Hammersmith. I'll tell you a few things you can find on Wikipedia, but then get to the stuff Wikipedia leaves out -the cool stuff. First off, the design was intended to be a luxury grand-tourer, similar to the previously folded Facel Vega. To that end, it's a four-seater, and was equipped with a V-8 - originally a Ted Martin 3.4 but replaced with a Chrysler 340. It was available with a ZF five-speed(!) or a Torqueflite 3, but that's not the crazy part that Wikipedia leaves out - a two-speed rear axle(!!). Yes, the Monica was equipped with a very modified Rover sedan/saloon-derived rear diff that was altered to provide a lower ratio with the drop of a lever. 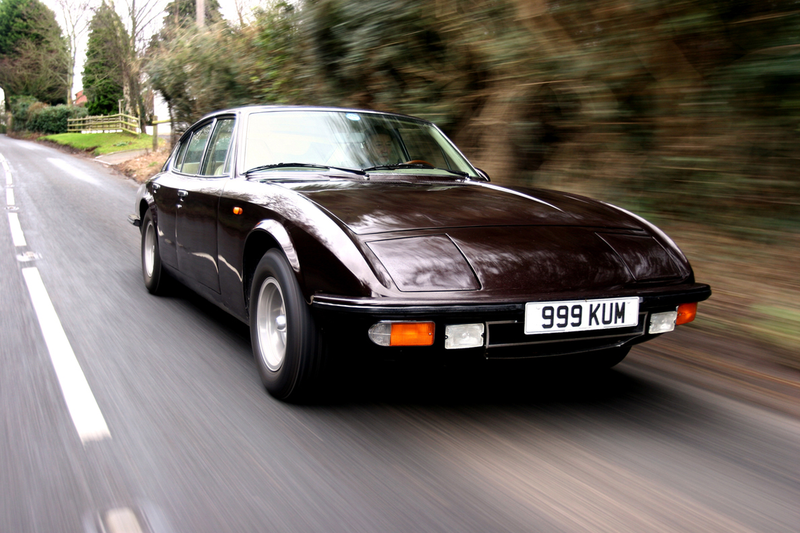 What we have, then, is a French ten-speed manual RWD V8 - worship it. That wacky diff, due to origins and setup, led to the rear suspension being De Dion - being a French/British small concern, they probably would have done that anyway, but I digress. The car weighed in at 3600lb, so needed to manage it well. Why did it weigh so much? Well, like an E-type, it was a welded-up monocoque sectional unibody, so that's not an answer in itself - indeed, it should/could have weighed a lot less. However, we're discussing a luxury car, and one that needed the body stiffness for four doors - so building it like the proverbial brick shithouse was de rigueur (that's French and stuff). As you can see, the body construction wasn't the only thing cribbed from the E-type - the idea to separate the engine from the radiator was adopted as well. You'd also be correct to note that the design features inboard springs. Perverse in its own way, but this is a luxury GT that weighs quite a bit - smoothness and best grip for its weight were paramount. Another thing setting Monica apart from Mr. E was the level of accessory - everything possible available in powered version. Power locks, power brakes, power steering, power windows, and of course, I believe A/C was available. Also, of course, power pop-up headlights after the earliest prototypes. Here, then, is the trouble: the company took so long getting into gear that it landed right on top of the oil crisis. Already struggling by the time my encyclopedia produced its glowing write-up, it closed its doors after producing only 8 production models and 22 prototypes. Panther Westwinds considered reviving it in '75, but ultimately passed on the opportunity - whether for better or worse, Monica was lost forever.